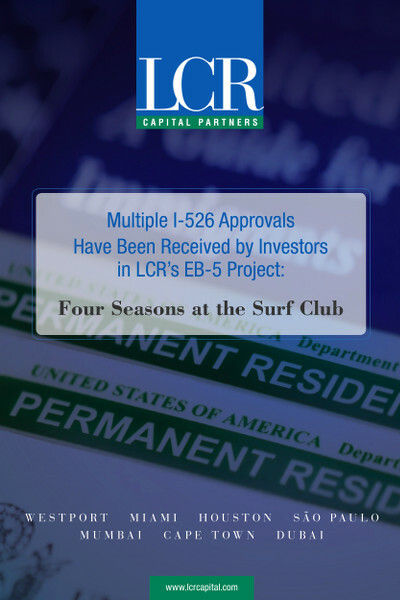 Westport, CT – LCR Capital Partners, the leading regional center operator in emerging EB-5 markets, announced today that multiple I-526 approvals have been received by investors in its Four Seasons Hotel & Private Residences at the Surf Club project located in Miami Beach, FL. The I-526 approvals represent the completion of the first stage of the EB-5 immigration process for investors. These first approvals came in only 18 months – the United States Citizenship and Immigration Services’ (USCIS) current average I-526 approval time is between 21 and 26 months. LCR Capital is contributing a $100 million EB-5 loan investment in Fort Partners’ development of the $828 million, 77-key, Four Seasons branded and operated hotel and 150 luxury residences. The iconic USCIS-approved project is currently under construction and on track to create over 9,000 EB-5 qualifying jobs. Founded by first-generation immigrants who met at and then graduated from Harvard Business School, LCR Capital Partners is a partner-owned, global investment firm which finances the development of signature real estate and hospitality projects across the United States. The firm’s investment capital is sourced directly from foreign U/HNW investors, C-level executives, professionals, family business owners and entrepreneurs who are interested in gaining access to the United States via the U.S. government’s EB-5 Investor Visa Program. The firm currently serves over 500 U/HNW clients from 26+ countries, is headquartered in Westport and has regional offices in Miami, Houston, São Paulo, Cape Town, Dubai, and Mumbai.